Which prescriptions can a Canadian pharmacy ship? Drugs which may have a so-called "second market" in the United States. 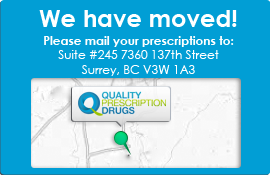 If you are not able to find the prescription drug you are searching for by using our price search database, let us know by contacting us at 1-877-244-0429, via email info@qualityprescriptiondrugs.com, or by using our customer feedback form.